Valspar Trade has announced it is launching a range of new trade products aimed at professional decorators with the two major retailers nationwide. The Sherwin-Williams-owned brand has a long-standing exclusive relationship with B&Q, since it was positioned as one of the retailer's flagship paint brands back in 2012 and it will now roll-out its Trade ranges to Screwfix and B&Q stores across the UK. Exclusive to B&Q is the new Valspar Trade solvent-based trim paint, which will be available in eggshell, high gloss and satin, in one-litre and 2.5-litre sizes. 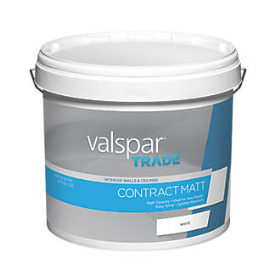 Valspar Trade contract matt is newly available in Screwfix branches in 10-litre tubs of white and magnolia, and the brand will launch a water-based trim paint in the chain September 2018, which will be available in high gloss, eggshell and satin in one-litre, 2.5-litre and five-litre sizes.